Eureka! 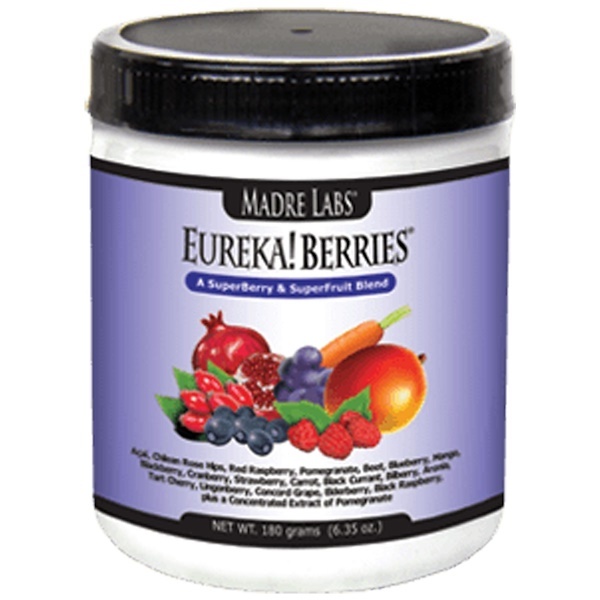 Berries is a concentrated premium SuperBerry & SuperFruit powder blend, containing a full-spectrum of richly-colored Berries & Fruits – plus Beets and Carrots. It contains a blend of Açaí, Chilean Rose Hips, Red Raspberry, Pomegranate, Blueberry, Mango, Blackberry, Cranberry, Strawberry, Black Currant, Bilberry, Aronia, Tart Cherry, Lingonberry, Concord Grape, Elderberry, Black Raspberry, as well as a Concentrated Extract of Pomegranate. This one-of-a-kind blend contains naturally occurring phytonutrients, and makes a great addition to a healthy diet and active lifestyle. Mix 1 scoop/serving of Eureka! Berries in purified water, your favorite 100% fruit juice or your daily smoothie. Eureka! Berries may be minimally sweetened if desired. For best results, use a shaker cup or blender bottle. 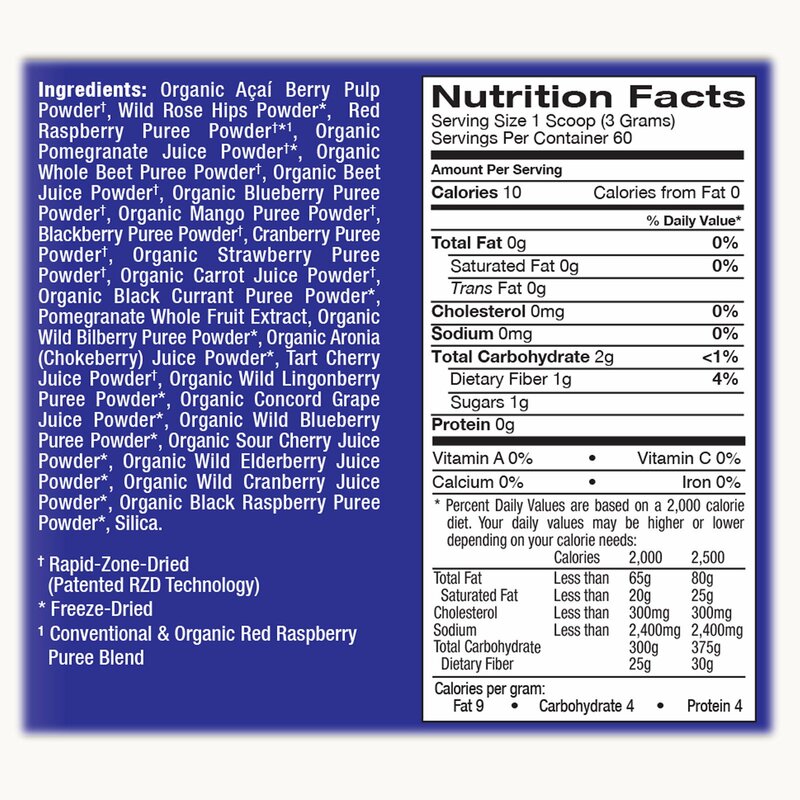 Organic açaí berry pulp powder†, wild rose hips powder*, red raspberry puree powder†*1, organic pomegranate juice powder†*, organic whole beet puree powder†, organic beet juice powder†, organic blueberry puree powder†, organic mango puree powder†, blackberry puree powder†, cranberry puree powder†, organic strawberry puree powder†, organic carrot juice powder†, organic black currant puree powder*, pomegranate whole fruit extract, organic wild bilberry puree powder*, organic aronia (chokeberry) juice powder*, tart cherry juice powder†, organic wild lingonberry puree powder*, organic concord grape juice powder*, organic wild blueberry puree powder*, organic sour cherry juice powder*, organic wild elderberry juice powder*, organic wild cranberry juice powder*, organic black raspberry puree powder*, silica.